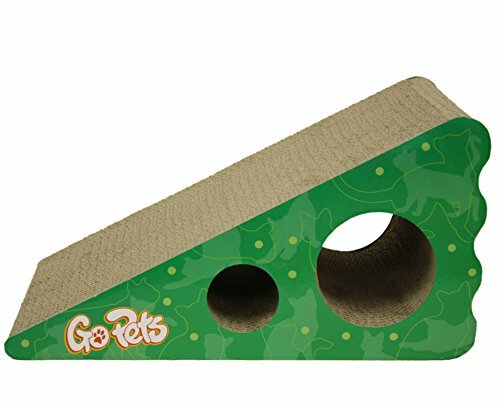 They make The GoPets Premium Cat Scratcher out of cardboard, a cat’s favorite material to scratch and sharpen their claws on. The wedge shape allows for optimal stretching and cat body positioning while sharpening their claws. Allowing cats to not just sharpen their claws, but get the relaxation and comfort that they are also looking for when they scratch. It’s very durable, but also fully reversible. So when one side wears out, you can simply flip it over. The design of the holes stimulate a cat’s natural curiosity and encourage more playing and engaging with the cat scratcher. A unique cat scratcher, with a design that cats prefer. Is the best way to keep cats from scratching furniture. It’s far more effective than deterrents like spray bottles or furniture covers because it serves their natural needs and instincts. The GoPets Premium Cat Scratcher lasts 2-3 times longer than other scratchers but is also environmentally friendly and fully recyclable. When it has worn out it’s easy to responsibly dispose of. And GoPets is a socially responsible company, donating a percentage of their profits to animal charities. Who is the GoPets Premium Cat Scratcher for? The GoPets Premium Cat Scratcher is great for very active cats that scratch a lot because it is more rugged and longer lasting than other scratcher materials and designs. It is also perfect for cat owners who want to keep cats away from scratching on furniture and in other unwanted places, by giving them a scratching surface that they naturally prefer. All cats need and want to scratch; it’s instinctive and feels good for them, so giving them a good way to express that natural impulse is important for cats and their owners alike. What’s included with the GoPets Premium Cat Scratcher? The GoPets Premium Cat Scratcher comes with a free bag of catnip to encourage your cat to engage with the scratcher and start to use it. The GoPets Premium Cat Scratcher has a number of great features that cats and cat-owners will love. Most people report that the GoPets Premium Cat Scratcher lasts for about a year with heavy use when flipped over at six months. When it needs to be replaced, it’s easy to simply recycle it with the rest of your cardboard, and the yearly investment of buying a new one is well worth the alternative costs of quickly replacing lower-quality scratchers, or, worse yet, replacing or repairing your furniture. To encourage your cats to engage with this scratcher and attract them away from furniture, place the scratcher at the site where the unwanted scratching is taking place (for example, at the base of the arms of your couch). Use catnip, toys, or simply your attention and encouragement to get them to use the scratcher instead of the unwanted furniture. If furniture scratching isn’t a problem with your cats, but you simply want them to get the most healthy and enjoyable use out of a scratcher, place it in a spot that the cats like and visit often, like a sunny windowsill, or near their preferred play area. Do They Enjoy the Location? Part of the reason that cats scratch is to mark their territory. If you place it in an out-of-the-way spot that the cat doesn’t normally like or prefer, they won’t be as interested in scratching it, so keep it somewhere that they like and enjoy. While most cats prefer a ramp design for natural, comfortable scratching, some cats happen to strongly prefer horizontal or vertical scratching. The Pawmosa Cat Scratcher is an innovative design that doubles as a horizontal or vertical scratcher, to engage more finicky cats. Like the GoPets premium scratcher, it’s made of dense, high-quality cardboard for satisfying scratching. If your cat won’t scratch the GoPets ramp design, it may be worth getting the Pawmosa Cat Scratcher and placing it horizontally or vertically and determining what angle your cat prefers. The GoPets Premium Cat Scratcher is truly made by cat lovers, for cat lovers. It’s specifically designed to meet all your cat’s multiple needs and instincts when scratching: to shed old claw sheaths, to mark territory, to get a satisfying stretch, and to relax and calm themselves. The ramp design is comfortable for cats and you can turn over when one side wears out. The holes excite cats’ curiosity and playfulness. The rugged material is friendly for the environment, both in manufacture from recycled materials and in disposal as it’s easily recycled by owners after use. It comes with a free bag of catnip and backed by a satisfaction guarantee. Even better, a portion of proceeds goes to help pets in need. So it’s a single product that benefits your cat, your furniture, the environment, and goes to support cats and animal charities that you may never meet. It’s an excellent choice for the health and happiness of your cat and your cat-loving household. Even better, it comes with a free Amazon shipping box, which your cat may like even more than the scratcher itself. Cat Scratch Deterrent – What are Some Options?